Fisheries officers are employed to protect our fisheries and promote responsible fishing. One of their roles is to ensure compliance with fishing regulations. These regulations are in place to ensure our fisheries resources are sustainable and shared by the Victorian fishing community. How will I recognise a Fisheries Officer? 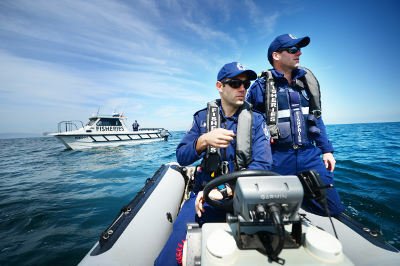 Fisheries Officers wear a uniform and the officer's name and title. A Fisheries Officer on duty but not in uniform will display official identification when they approach you, which will include an identification card, the VFA badge and the Officer's name. What can I expect during an inspection? measure and count fish in your possession to check compliance with size and bag limits. What powers do Fisheries Officers have to protect Victorian fisheries? seize any fish, fishing gear or other equipment, including boats and vehicles, that have been used in an alleged offence or is in the possession of a suspected offender. What happens if I am detected committing an offence? advise you of the likely course of action. What are the compliance options used by Fisheries Officers? Options range from providing educational material to prosecutions. Where it is apparent that a breach of the legislation has occurred, the VFA will take the appropriate action depending on the severity of the offence. cancellation of a licence or permit. What happens if I don’t comply with a fisheries officer’s directions? During an inspection or enquiry, an officer may request certain things of you in accordance with their legislative powers.